free high-speed wired and wireless internet access. and a variety of food and beverage experiences. and all the other attractions and entertainment of Las Vegas. 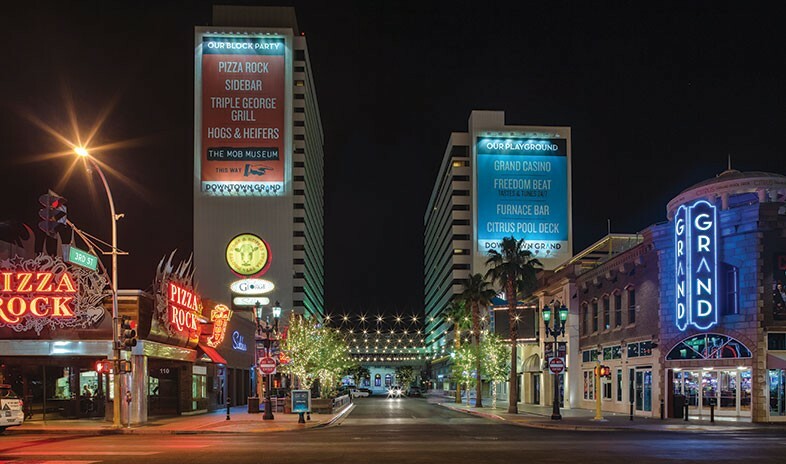 Once known as the Lady Luck Hotel & Casino, the Downtown Grand Las Vegas reopened in 2013 in the heart of revitalized downtown Las Vegas. The property features two towers, 18 and 25 stories tall, that are connected by an elevated walking bridge over Third Street. The towers house 629 guest rooms and suites offering luxury accommodations that set a new standard for sophistication and style. and fun, with an infinity pool, restaurant and bar, semi-private cabanas, fire pit, and grass seating area. The Citrus Grand Pool Deck can also host outdoor receptions for 1,200 guests, just one of the property’s variety of special-event options. Over 36,000 square feet of indoor and outdoor meeting and event space provides venues for everything from intimate corporate meetings to a block party on Third Street for up to 4,000 attendees. The Downtown Grand has the perfect backdrop for all customized occasions.